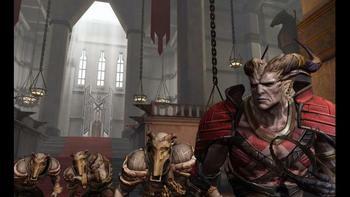 Meet the EnemyWe once again return to the world of Thedas in Bioware’s next installment of the Dragon Age series. For those not familiar with the Dragon Age series, it takes place in the world of Thedas where, due to the misuse of magic, the “Maker” has turned his back on the world. Those that caused this were turned into “Darkspawn”, evil creatures without souls that destroy everything in their path and live mostly underground. Once every few hundred or thousand years, the Darkspawn gather together into a large horde and assault the surface under the command of an “Arch Demon”, an ancient and powerful “Old God” that has been corrupted by the Darkspawn. 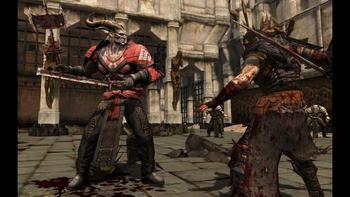 The previous game, Dragon Age: Origins, took place during the Fifth Blight and culminated in the player’s character, “The Warden”, killing the Arch Demon and saving the land. Dragon Age II begins at about the same time as the previous one, but from the perspective of “Hawke”, a refugee fleeing the Blight with his/her family. The story is actually told by one of Hawke companions, “Varric”, a surface dwelling Dwarf with a knack for storytelling. As Varric recounts the story, you go back to live through Hawke’s adventures. 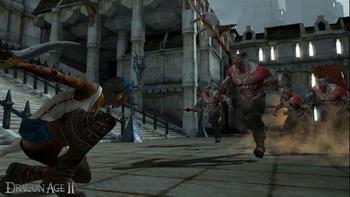 While running from the Blight, Hawke and their family are attacked by Darkspawn at every turn. While running, they meet a character from the previous game named Flemeth, an ancient and powerful witch. She offers to help them get away from the Darkspawn, but only if Hawke takes an amulet to a group of elves near their destination, the city of Kirkwall. Hawke agrees and their party is taken to a coastal city to sale to Kirkwall. Once the party arrives there, the story really begins. Let me start off by saying that I enjoyed the first game. It has issues, ok, many issues, but the characters and story really carried the game for me. For Dragon Age II, Bioware seems to have fixed a great deal of the overall bugs. It was many hours into the game before I noticed my first glitch, and it wasn’t much. Bioware drew on some of the successes it had with Mass Effect 2 to help improve this game. The character creation screen was fairly nice. Though there weren’t as many options as the first game, that seems to have actually eliminated a number of the bugs from Origins. You still have the same options as to what class you are, Warrior/Rogue/Mage, and can choose your gender, but now you can only be human. I found it a little disappointing, but it worked well with what they were trying to do here. The facial customization was very nice. They had several pre-created options, but they also had hundreds of customizable combinations available. I probably spent 45 minutes on customization alone. Where the first game had a simple list of options for conversation and your character was never voiced, they brought in the Conversation Wheel from Mass Effect 2 and fully voiced all characters. This brought a sense of conversational depth that was greatly appreciated. The options weren’t necessarily good or bad, but could be found all over the spectrum. Different characters would react differently to how you answered a question or how you spoke to them. Some did not appreciate Hawke being nice as they thought it made him/her weak. I myself loved the fact that there was almost always a sarcastic reply. I couldn’t help but be a smartass the entire game. I ended up with some very interesting conversations. Like most Bioware games, this game takes place in 3 acts. The story inside each act was very nice, and the character development was great. There were a large number of side quests in each act that, while providing opportunities for better gear and more XP, did not seem to further the story as much as they should have. The main story line, while fairly well planned for each act, did not seem to have much tying the over-arching story together. While it was nice not to be the “Savior of the World” for once, they didn’t seem to really put much in its place. The scope of this game seemed rather limited compared to the previous installment. In Dragon Age: Origins, you traveled all over Ferelden, one of the countries in Thedas. However, in Dragon Age II, you only travel within one city, Kirkwall, and the surrounding countryside. Though Kirkwall is huge, the game did not feel as “epic” as the previous one. One issue that I found particularly annoying was the “dungeons”. I had to have gone through the same cave 57 times during the game. The team seemed to have come up with half a dozen dungeon environments and then moved on. While this saves the developers time and money, it can be really aggravating to your players. On the plus side though, I pretty much knew where everything was. The control interface was pretty much unchanged since the first game. You have access to the action wheel when you hold one of your triggers. Through the wheel, you could control what ability your party members used, what items they could use, and where they moved to. The Tactics menu seemed to have more options than the first game, but, like the first game, I chose one of the presets for all of my characters. That way I didn’t have to micromanage them the entire time. The combat targeting seemed to also get a bit of an overhaul this time around. While targeting could still be a bit of a problem in melee, you could use the action wheel menu as a targeting reticle, like in previous Bioware games. I found there to be a significant step in graphical and sound quality. The environment was much more detailed. The enemies and other NPCs were beautiful. Bioware seemed to have taken a great deal of time on the simple detail of objects in the world. The player abilities and spells, of which I used a great deal being a Mage and all, were much better than before. Throwing so many spells around though, seemed to clog up the screen some, too much going on if you have a horde of enemies, which was often. Like the previous game, during and after combat, your characters are covered in blood. It is everywhere and can be seen coming out of enemies as you beat on them. It looked much more fluid and natural this time around. The sound was beautiful most of the time. Every spell and ability had a very nice sound, as did the enemies, especially when they would die. The background music was very nice and I found that it seemed to fit the game very nicely. A problem that I did find with the sound was if I had more than one offensive Mage in the party. Our various spell effects and sounds would often cover each other up. It was not a bug I noticed all the time, but it did happen occasionally. I really enjoyed this game. It had great characters, fun game play, and a decent story. I really enjoyed the character interaction with all of my party members. I found the combat fairly easy until later in the game where they seemed to simply bombard your party with enemies. Resource management for your party was much easier than in the previous game, so no complaints there. That said the game did have its issues. No real over-arching story, repetitive dungeons, and a lack of an epic feel. While I still enjoyed the game and will likely play it though again, it kind of feels like Bioware missed the mark with this one. Though, some of the story points in Dragon Age II have made me really look forward to the next one. I really want to see what happens next. If you liked Dragon Age: Origins, I think you’ll love Dragon Age II. If you’re joining the world for the first time, you may want to rent this one and see how it feels.